Hollybeary Creations : YNS August Release!! 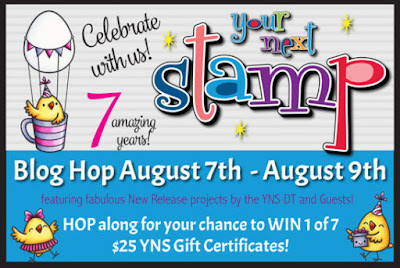 It's time for the August Release from Your Next Stamp!! This month it's a Huge Celebration as YNS is turning 7 so we are having a huge celebration. Today kicks off the Sneaks and be sure to join us tonight at 10pm EST for the Blog Hop where we reveal all the new products and the Party kicks off!! I'm using the super cute new set Birthday Chickie for my project today. I created a watercolored background using some Distress Ink on a piece of Watercolor Card stock and then I die cut it using the Stitched Rectangle Die set. I added the panel to a Black card base with some Foam adhesive. Then I stamped the sentiment onto the card using my Misti with some VersaFine Black Ink. I stamped the image a second time on some White card stock and die cut one of the Puffy clouds from part of the sentiment. Then I added the cloud over the sentiment on the card front. I stamped the Chick image onto some Copic friendly White card stock and colored the image in and then I used the coordinating dies to cut it out. I added some Clear Wink of Stella to parts of the image as well. I adhered it over the card front with some additional foam tape and then I added small puffy cloud die cut to the front as well. For an extra pop of sparkle I added some Cosmic Crush Gumdrops. 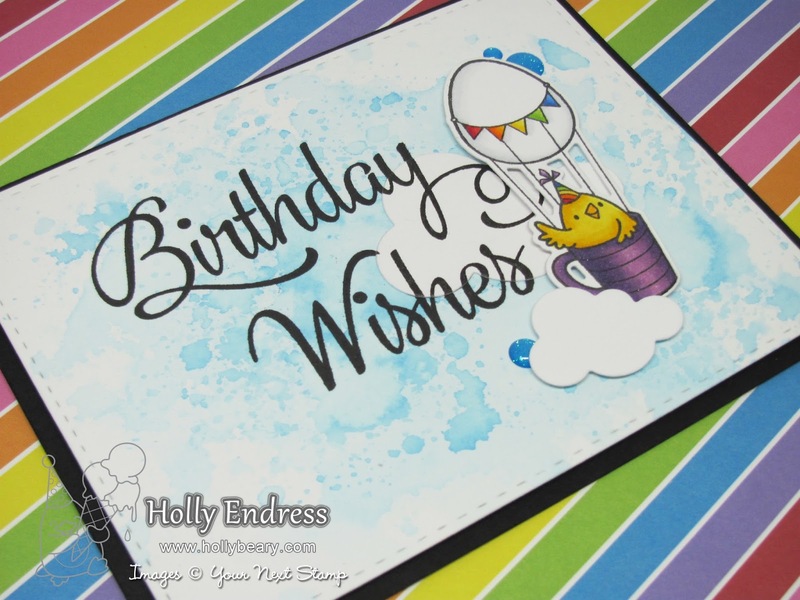 This is a fun set with lots of images perfect for all your Birthday cards and great sentiments too. Head over to the YNS Blog to see more Sneaks from the Design Team and be sure to join us tomorrow for the Blog Hop!! The little chicks set is my favorite in the release! Cute card! Such a cute creation! 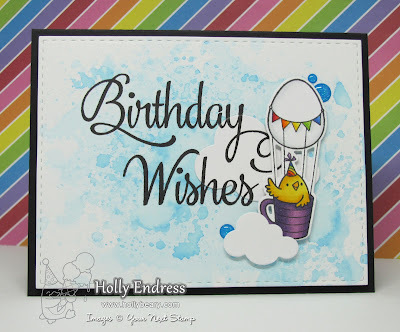 Love the wishing sentiment with birthday Chickie and soft watercolored BG, so perfect! Such a sweet card Holly. Love the images and your background is so pretty! I love your watercolor background! Very pretty! Super adorable card! Love the new chickie and your watercolored sky! Your water colored sky is absolute perfection for this adorable stamp! LOVE it. Brilliant card Holly. Love your background. WOW.